Multiple find requests in a search allows you the option to make your search more robust. For example, what if you want to find records that match one thing but you want the found set to not contain something else. 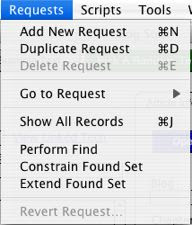 Similar to the task of creating new records in browse mode, you can create new find requests in find mode. The first request in the request order runs first and following requests in line after that. Many users don’t utilize multiple find requests because they don’t know or are not comfortable in using them. However, after you get a few successful multiple request searches under your belt, you may find that you use them all the time. Here you can see the Requests menu, only available when you are in find mode. You can see the add, duplicate and delete request options. Much like what you can do when working with records in browse mode! When we were discussing search operators, we mentioned the range operator. In review, the range operator is three periods ( ... ) and is used to find the matching records between two values. This is most useful when dealing with numbers, date and time fields. If you were to go into Find Mode and type 10...20 and execute the find, you would find the records with values between 10 and 20 ( including 10 and 20 ) in that field ( for example you might get records with values of 11, 15 and 20 ). You can even use the range operator to find ranges of text values. For example, you can do a find for names ranging between A and G by using a search string of “ A...G”. Sometimes it is not so much what you want to find but what you don’t want to see. 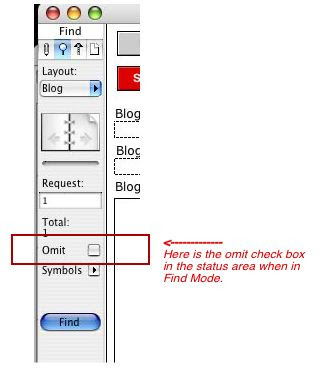 When you enter find mode, you may have noticed the Omit check box in the status area. Normally, you would enter into find mode, type in Bob, execute the search and the Bob matching records will be in the found set. Now if you would enter into find mode, type in Bob, click the Omit check box, execute the search and the Bob matching records will be omitted and all the other records are in the found set.